Maria Kefalas is an Associate at Abrams, Fensterman, Fensterman, Eisman, Formato, Ferrara, Wolf & Carone, LLP. Ms. Kefalas concentrates her practice in elder law, special needs planning, estate planning, estate administration and guardianship. Ms. Kefalas received her Juris Doctor from Benjamin N. Cardozo School of Law and her Bachelor of Arts in Politics from New York University. At Benjamin N. Cardozo School of Law, she held the positions of Staff Editor and Associate Editor for the Arts and Entertainment Law Journal. 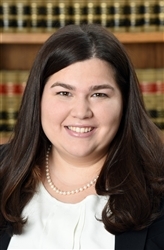 Prior to joining Abrams Fensterman as a law clerk in 2015, Ms. Kefalas worked as a legal intern in the New York State Office of the Attorney General. Ms. Kefalas also participated in the Bet Tzedek Legal Services Clinic at Benjamin N. Cardozo School of Law, where she represented elderly, disabled and low-income individuals in a variety of civil issues. Ms. Kefalas is admitted to practice law in the State of New York.